This topic describes how to deploy multiple instances of PKS on vSphere with NSX-T infrastructure. A multi-foundation deployment of PKS lets you install and run multiple instances of PKS. The purpose of a multi-foundation deployment of PKS is to share a common vSphere and NSX-T infrastructure across multiple foundations, while providing complete networking isolation across foundations. 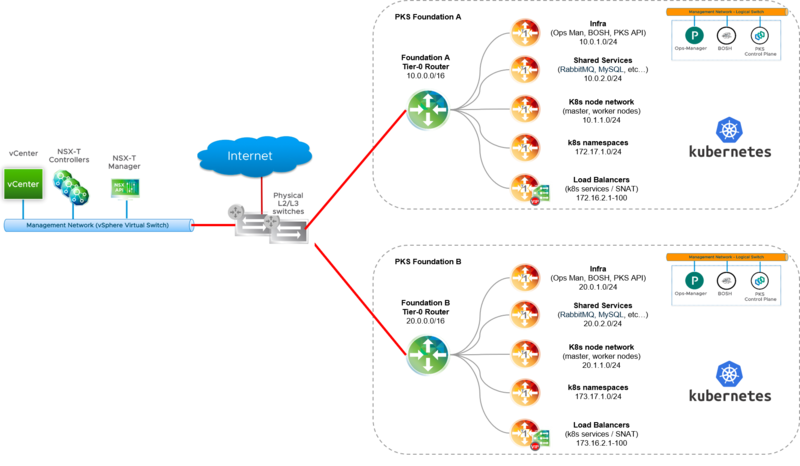 As shown in the diagram, with a multi-foundation PKS topology, each PKS instance is deployed to a dedicated NSX-T Tier-0 router. Foundation A T0 router with Management CIDR 10.0.0.0/16 connects to the vSphere and NSX-T infrastructure. Similarly, Foundation B T0 router with Management CIDR 20.0.0.0/16 connects to the same vSphere and NSX-T components. As with a single instance deployment, PKS management components are deployed to a dedicated network, for example, 10.0.0.0/24 for PKS Foundation A; 20.0.0.0/24 for PKS Foundation B. When PKS is deployed, networks are defined for nodes, pods, and load balancers. Because of the dedicated Tier-0 router, there is complete networking isolation between each PKS instance. One Tier-0 router for each PKS instance. For more information, see Configuring Multiple Tier-0 Routers for Tenant Isolation. The Floating IP pool must not overlap. The CIDR range for each Floating IP Pool must be unique and not overlapping across foundations. For more information, see Create Floating IP Pool. PKS instances can be deployed in NAT and no-NAT mode. If more than one PKS instance is deployed in no-NAT mode, the Nodes IP Block networks cannot overlap. For any Pods IP Block used to deploy Kubernetes clusters in no-NAT (routable) mode, the Pods IP Block cannot overlap across foundations.